From the Alto Piemonte, directly north of Torino, bordering the Valle d’Aosta, comes two separate, but associated cantine: Ravera Chion of Chiaverano & Chiussuma of Carema. The former producing mainly Erbaluce di Caluso; the latter Carema DOC, a blend of Nebbiolo plus 10% ‘Neretti’ (local black grapes). The common denominator to both is young Matteo Ravera Chion, a tall, lithe, astute winemaking graduate of Torino University, whose family roots lie in the ancient glacial, acidic, morenic soils close to Ivrea, home also to Erbaluce. Indeed their fruit comes from one of the grape’s most vocational sites, trellised high on ‘pergola Calusiese’ (at 1k plants/ha) on the splayed slopes of the Serra di Ivrea, in the comune of Palazzo Canavese. Erbaluce is related to Fiano, having been brought to Piemonte by the Romans. Its finest expression is achieved among the Canavese hills north of Torino, in the comune of Caluso, where it looks up the Val d’Aosta & benefits from its dramatic temperature oscillations. It was first documented in the 1600s by G.B.Croce, & then became Piemonte’s first DOC bianco in 1967. Further north, 30mins by car up the tightening, sheer, granite & mica towards the Val d’Aosta, is found the 60ha region of Carema, whose history dates back to 1539 & to the documented works of Papa Paolo III Farnese, in which he celebrated the wines as being worthy of ‘Principi e Signori’ (‘Princes & Gentlemen’). Here Matteo joined forces with locals Rudy & his wife Alessandra to create Chiussuma, & in 2016 their first Carema was born from 3ha of Nebbiolo (local Picotener & Prugnet clones) vines trained high on ‘topia’, trellised across granite/mica pillars that delimit the tiny terraced vineyards at up to 600m asl; the morenic soil carried up the impossibly steep slopes from the valley bottom. Availability of both wines is limited to circa 400 bts of Erbaluce (with none produced in hail-hit 2017! ), & 300 bts of their inaugural Carema. 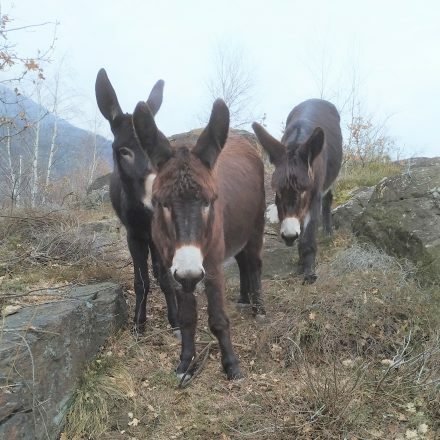 Their Carema vineyard is also home to three divine donkeys: Ernesto, Angelica (with long fringe!) & Nerina! 2016 Erbaluce ‘Nramia’ Vino Bianco – 12.5% abv, 12 mths affinamento on the lees in stainless-steel, bright pale yellow/miele, the nose is crystalline, Valle d’Aosta fresh, snow pure with delicate, lime spremuta, soft, pure, grape & yellow plum fruit notes, with racy, glacial, granite freshness coursing through it – spettacolare! Similarly to the taste, it’s very delicate, with glistening purity, the finest of creamy leesy texture, so transparent & Alpine pure, a hint of yellow pressee/spremuta, of citrus pulp; love its effortless weight, of minerals, mica bright, the most delicate of bianco spina fragrance, layered, yet remains so prim & pretty. Gorgeous.